A strategy is the collection of technical indicators that you have selected, and the parameters which will dictate your hoppers buying and selling decisions. These do not include the other aspects that may guide your hoppers trading, including your selected coins or additional tools. This is purely the market analysis. Here’s how to apply strategies in your hopper. 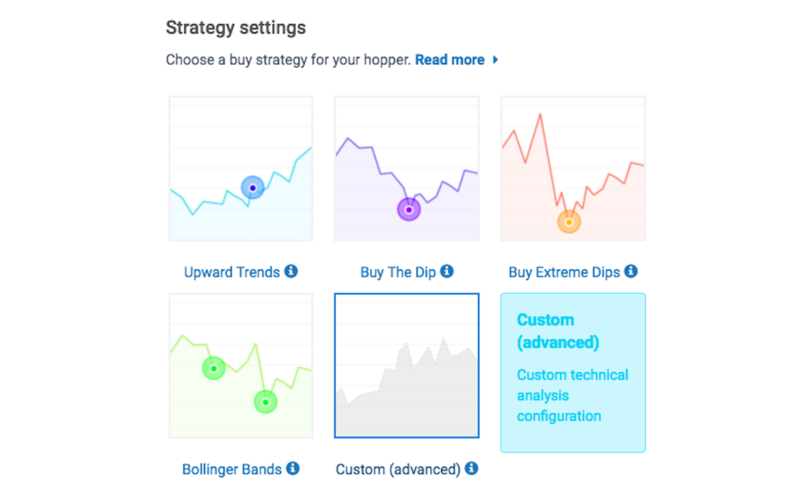 Next to the multiple TA settings, Cryptohopper offers a new powerful strategy designer. Not only does this dedicated space offer more room for configuring your hopper’s buy and sell decisions, it also offers more than 80+ combined indicators and candle patterns. Head over to strategies to create, test and brand your custom strategy. Now, when you go to config, next to Multiple TA, you will now also see 3 new options when you select your strategy. These are the ones you have bought on the strategy marketplace. A very capable analyst can therefore design a powerful strategy on the strategy designer and sell it to others on the marketplace On top of all of this, if auto-updating is on and the creator of the strategy adjusts it to changing market conditions, you won’t be left behind. Your hopper will adjust along with his/her changes. Be advised, auto-updating lasts for one month, after which you will be left with the latest version of the config. This is to incentivise admins to continue working. We offer built-in basic strategies that are offered for free with Cryptohopper. If you select templates on the Cryptohopper new user wizard, you will receive one of these. These strategies are very basic, and only involve the indicators shown in the Multiple TA settings. Next to this, these are static. They will therefore not change according to market conditions. These are the strategies you have built yourself using the strategy designer. Once you have saved the strategy, it will become available under strategies in the config. You can design several strategies and just impot them there. All of the above options are available in config pools. You can therefore apply different strategies to multiple different coins. However, you can only select a built in, market or designed strategy if you are not using basic multiple TA settings in your base config.